Peter Jackson, of ‘Lord of the Rings’ fame, has released a documentary called ‘They Will Not Grow Old’. It is about World War I using original film and audio records from the BBC and British Imperial War Museum. The documentary was produced for the centenary of the end of World War I. It is an amazing technical achievement. Peter Jackson took old black and white film, colorized it and made it 3D. The soldiers’ stories are told by them, from interviews conducted by the BBC in the 1960’s . 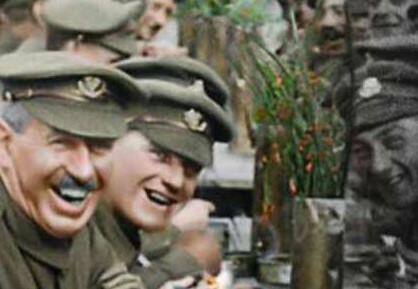 Since the original movies were silent, Peter Jackson hired lip readers to find out the soldiers were saying. He then hired actors, with the appropriate regional accent, to voice those words in sync with the movies. Other aspects of trench life are documented. Water. Cigarettes. Brothels. Mud. Describing the mud a soldier commented: “I've seen men sinking into the mud and dying in the slime.” Imagine drowning in mud. Humor was used to pass the time. A soldier told this story: “They (the Germans) put up a sign - "Gott mit uns. God is with us. And we put a sign up in English -"We've got mittens too!" When the movie ended, the audience was dead silent. For thirty minutes after the credits, Peter Jackson explained how the movie was made. Virtually everyone stayed to watch. The movie is only shown on selected dates in selected cities. You can look at its schedule and learn more about the movie on its website - https://www.fathomevents.com/events/they-shall-not-grow-old. War is horrific, Over 20 million died in World War I and many more millions wounded. This movie is a way to respect and honor those who served. Peter Jackson dedicated the movie to his Grandfather, William, who died young of his wounds after the war. Ironically, William Jackson fought alongside J.R.R. Tolkien, at Gallipoli. I highly recommend this film.